We never know when something bad might occur. Terrorist attacks and local unrest are reported on the news all the time. How would it affect you if you were traveling in a place where something horrific happens? 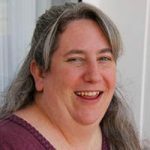 Our TravelingMom with Daughters learned the hard way that she was not as prepared as she thought when a terrorist struck during her family’s long-anticipated first trip abroad. 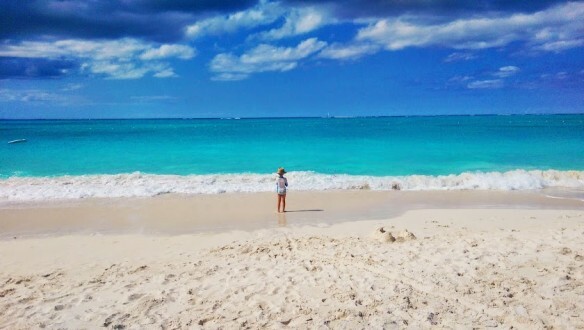 Don’t make the same mistakes she did; follow these safety tips for international travel. For over a year, my family had been counting down the days until our London trip. We felt London was safe, or at least as safe as any international destination can be these days. 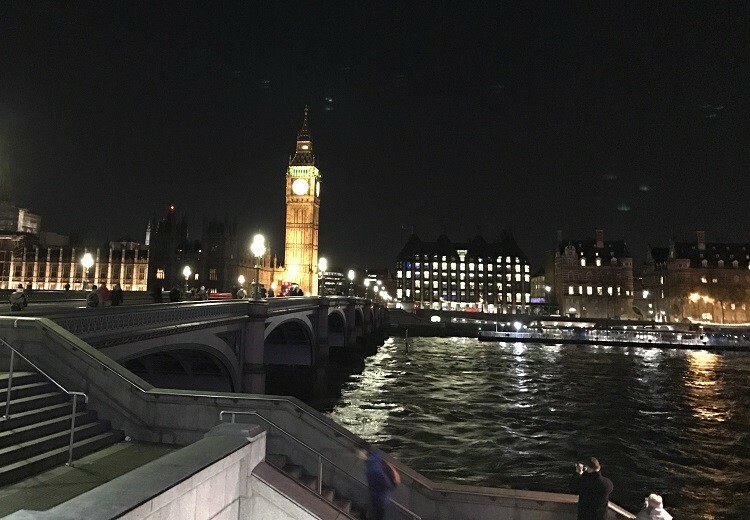 Our hotel was located on the south bank of the Thames River, close to tourist attractions like Big Ben and the London Eye. 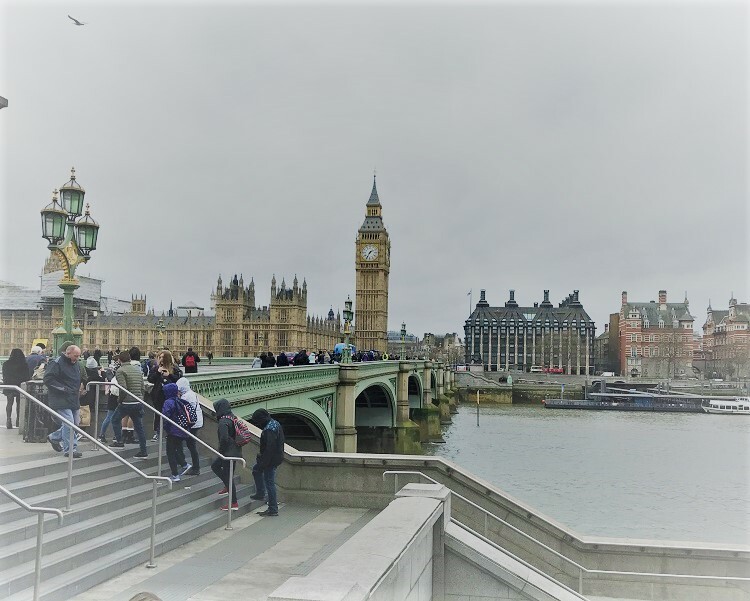 On the day we arrived in London, we eagerly headed out to explore, walking across the Westminster Bridge. The area was crowded with tourists, tour operators and souvenir stands. Iconic red double-decker buses and black cabs fought the bridge traffic, honking horns as they passed. The day was gray and extremely windy, so we only crossed over briefly to get our up-close photos of Big Ben. We had plenty of time, so we figured that we’d explore the area near Parliament on another, less windy day. Later that evening, I suggested a walk to my 14-year-old daughter, Hannah. The wind and crowds had died down, so we took our time walking across the Westminster Bridge again. We enjoyed taking photos of the sights along both banks as they were all lit up in the darkness. It was a beautiful sight and felt almost surreal to actually be seeing the area in person. Knowing exactly where you’re planned to be can help set minds at ease if something happens while you’re traveling. While our Make-A-Wish Coordinators in both Michigan and London knew our exact plans, family and friends did not. Next time I will absolutely make sure that those closest to us have a copy of our full itinerary. That way they will know if we are supposed to be near the area of concern or not. And I will share the contact information for our hotel(s). That way if cell service is interrupted, loved ones can check on us via landline. Our second day of sightseeing was filled with tube rides to more distant locations in town. We also took a river cruise along the Thames. As we passed under the Westminster Bridge, we snapped the requisite photos of Parliament. The boat then turned around and took us to view sights in the other direction. Later that afternoon, Hannah and I ascended 135 meters up in the air on the London Eye. The rest of the family wasn’t thrilled with the height, so stayed below. 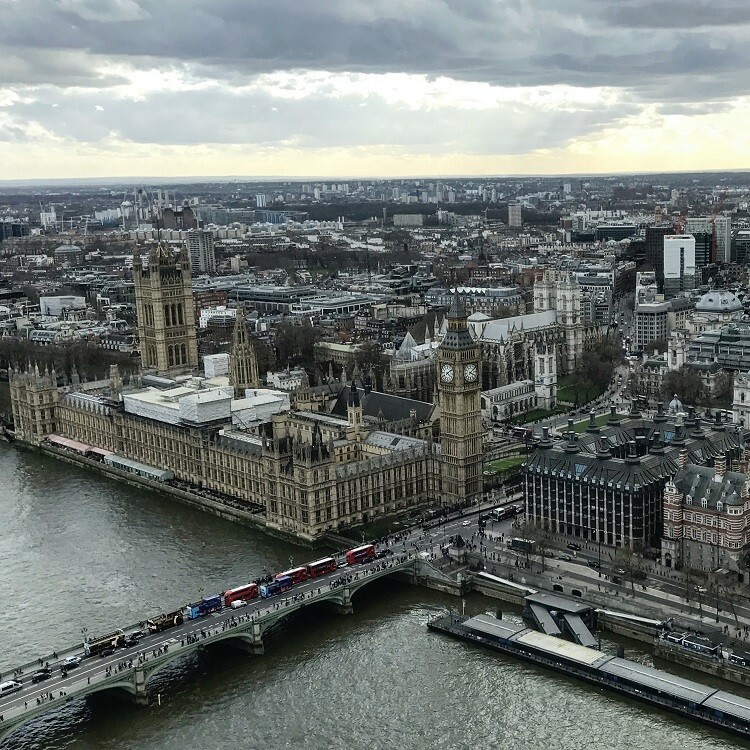 We took many photos of the area from the top of the Eye, including Parliament and the Westminster Bridge. For our trip, we researched the available options for cell phone and internet service. We wanted to avoid extra costs for an international plan. Our carrier only charges 50 cents per text when overseas. Our decision was to communicate with each other via text when necessary since we’d be together for most of the trip. My husband’s work phone had unlimited international calling and data so we knew we could use his phone in an emergency. What we didn’t think about was that my phone number was the contact that our trip coordinators had. And our family and friends didn’t have my husband’s work phone number either. We never thought about having to call home while we were gone. Or whether we might need to be reached by those at home either. Wi-fi is available in most public locations, and in London many of the iconic red phone booths are now wi-fi hotspots. But that doesn’t help you make phone calls or get news if you happen to be stuck in an area with no wi-fi or if service is interrupted. I will never travel internationally again without some way to make and receive calls on my phone. I will also make sure everyone I care about has the number of whatever phone I do have available with me. 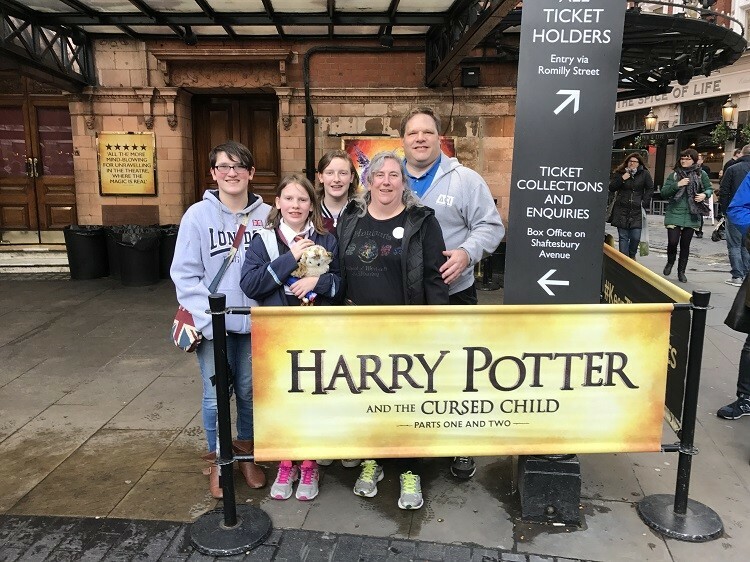 On Wednesday, March 22nd, our family had tickets to Parts I and II of Harry Potter and the Cursed Child. We rode the tube to the theatre district and explored until the play began. There is a 2-hour break between the two parts, so we stumbled out into the brightness at the end of Part I. Our plan was to get some food and relax until returning to the theatre. Instead, we heard rumblings among the crowd of a terrorist attack. We weren’t sure what was going on, and there was no wi-fi available outside the theater. Then I received a text from a friend back in the U.S., checking to make sure we were ok. When I asked why, she told me there had been an attack near Parliament. We immediately set out to find a wi-fi connection so that we could get news of what had occurred. Our phones were then flooded with Facebook messages and emails from concerned family and friends wanting to check on us. The full details of the attack weren’t known yet. 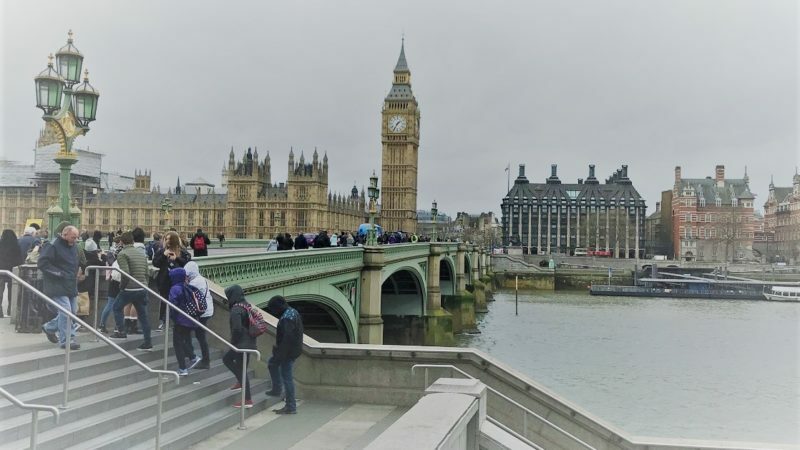 We found out that it had taken place on the Westminster Bridge, only two blocks from our hotel. As a first-time international traveler, I was not aware of the US State Department’s Smart Traveler Enrollment Program (STEP). It wasn’t until the day of the attack when it occurred to me to look into whether we needed to check in with our embassy. I learned that the STEP program is available to all U.S. citizens traveling abroad. The program allows you to register your trip with the nearest U.S. embassy or consulate. This serves two purposes. First, the embassy knows that you are there and can check on you in case there is any type of incident. You also get notifications of any safety concerns or considerations while you’re traveling. And friends and family can get in touch with you through the embassy if necessary. The STEP program is free and I will absolutely take advantage of it when traveling overseas again. The emotions we felt that day are difficult to describe. Relief, that we were ok and hadn’t been anywhere near that area on that day. Shock, that such a thing had occurred in a city where we felt was safe, during the very week we were visiting. Sadness, for the victims of the attack and their families. Sorrow, that people are capable of such acts at all. Plus, yes, fear. After reassuring our worried loved ones, we ate and returned to the theatre for Part II of the play. Not attending wasn’t an option. This play was the main reason we were in London at all, for Hannah’s Make-A-Wish trip. The theatre district was not near the affected area. But we did wonder if we’d be able to get back to our hotel easily later on. We could see and hear helicopters circling above, and distant sirens all around us. Thankfully we had no trouble getting back that night. I saw I had a missed international call on my cell phone, but didn’t check the message. Later, I discovered it was from our London Make-A-Wish Coordinator checking on us and advising that the hotel was accessible. We were fortunate that we could get to our hotel after the attack. But if it had been blocked off, we had nowhere to go. Make sure that you know where the closest embassy or consulate is and how to contact them. Carry that information with you at all times. Keep a paper copy of the local public transportation routes with you too. I did have our passports with us, which is a good idea in case you need to provide identification. If your kids are older, talk to them about where to meet if you get separated and make sure they know how to get there. For younger kids, tuck your business card in their pocket or write your cell number on their arm in permanent marker. This way someone can reach you if you happen to be separated in a moment of chaos. The next day was another planned sightseeing day. We knew that Westminster Bridge was still closed, so Hannah and I used the next bridge over instead. 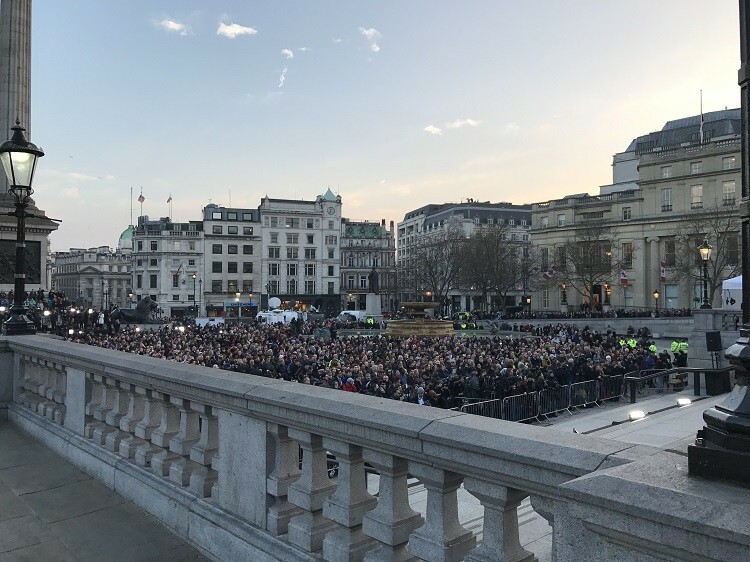 This bridge was crowded with tourists as well as news crews recording footage with the empty Westminster Bridge in the background. With my camera’s telephoto lens, I could see police and crime scene vehicles near a tent set up at what I assumed was the point of the attack. We could see and hear helicopters circling around above us and emergency vehicle sirens all around. My husband could hear additional sirens from our hotel room as well. 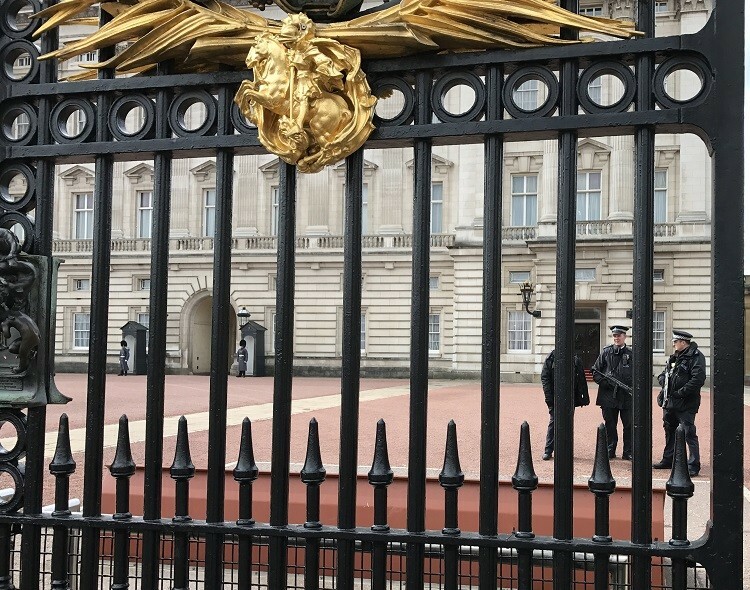 Hannah and I walked down the Mall, to Buckingham Palace, where we were told there would be no changing of the guards that day. We wanted to see Westminster Abbey, but turned back as we didn’t think we would be allowed to get that close to Parliament. Nobody knew if there would be another attack. I had mixed feelings all that day. But we felt that with the city on high alert, there was an increased police presence throughout the area. We wanted to show the kids that we weren’t going to let fear take charge. We continued with our planned activities, including a free Harry Potter walking tour from Strawberry Tours. The older girls and I had a lot of fun and our tour guide was engaging and informative. My husband and I stayed in constant contact via text throughout the day. Traveling is always an educational experience for kids. It’s just not always the kind of education you might choose to give them. But in these days and times, it’s an important one. If an event does occur on your trip, talk to your kids about what’s happening. You know your kids best as to what they can handle, so be as honest as you’re comfortable with. Show them not only how to be safe, but compassionate as well. 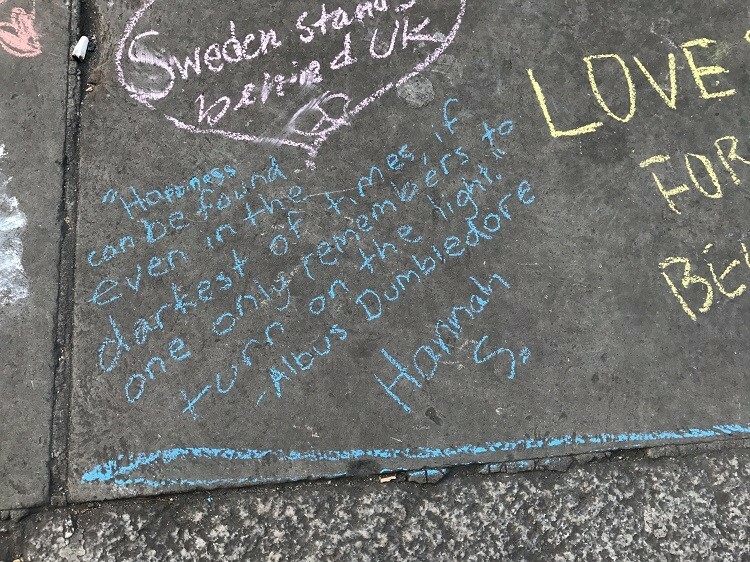 When we learned that a vigil would be held that night in Trafalgar Square, Hannah immediately wanted to go. As did I, to show respect to the victims of this horrific attack and to the city that we were beginning to love. The vigil was a somber affair, but also one of hope and love. All around we could see and hear people expressing positive messages. Areas were blocked off so notes of condolence and support could be written in chalk on the sidewalk for the victims and families. The overall feel was of solidarity and determination. We lined up along with many others to listen to London dignitaries speak. 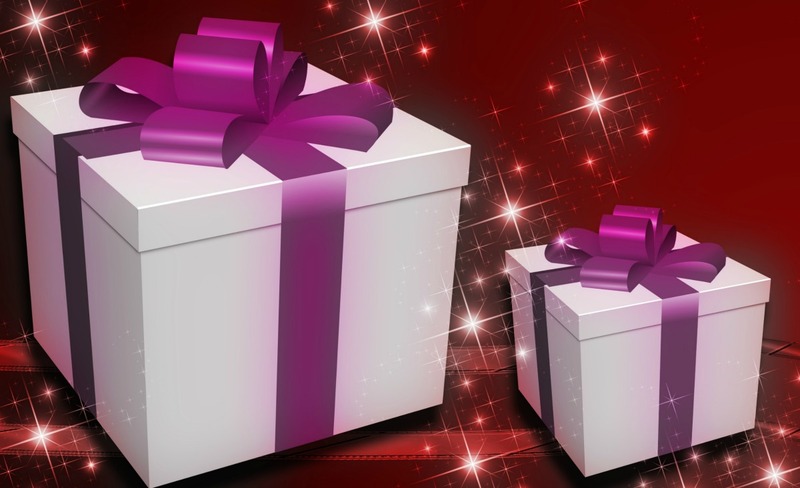 Our kids are older – teens and a tween – so we were very open with them about what had occurred. I felt it was important for the older girls to attend the vigil with me. As a sign of respect, and also a way to show them that global events aren’t just things that we see on the television screen from the comfort of home. Sadly, I can’t think of a more educational moment that we could have had on this trip. I only wish it hadn’t been necessary. 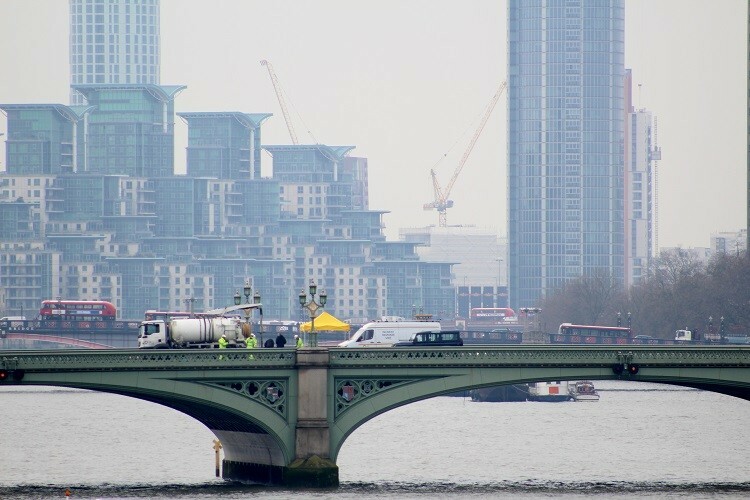 We were fortunate not to be on the bridge or near Parliament that day. I’m so grateful for that. So easily we could have been, if our play tickets had been for a different day. There is no way to anticipate where or when such terrorist acts might occur, but I refuse to let fear keep me or my family from the love of travel. Thank you for clear-minded and compassionate advice. Your approach is the best antidote to fear or anxiety. I have never contacted consulates or embassies when I traveled BUT certainly will, thanks to your advice, from now on. You are right that it’s good to share your travel plans with a close friend or family member, so they know where you will be and, if possible, how to get in touch if there’s a problem in the destination you are visiting. Here’s wishing you and all travelers safe journeys in our dangerous world.